Recent attention to the fine McQueen/Ridley “12 Years a Slave” invites us to consider the harrowing instability of even the most personal elements of our existence. In the film, a free black man living in a community where he has no expectations of abduction is seized and enslaved, then must struggle for over a decade to maintain his spirit until he can be identified, freed again and allowed to return to his family and life as he had once known it. If Solomon Northrup’s original chronicle weren’t so specific and persuasive, we might be inclined to skepticism concerning both the mercurial nature of our species and the victim’s strength of character. But stuff happens, and our early history offers many such appalling stories, including one which many of us have bypassed, ignored or been unable to extract from its distracting narrative environment. Recently, I was shocked into awareness as I discovered the details page by page. The great voyage of Jefferson’s Corps of Discovery has long ago entered our national mind and bloodstream to flourish as both a creation myth and a national epic. Although the boom in biographies and histories, as well as the boost from Ken Burns’ documentary film, have made the narrative (complete with variations and agendaed interpretations) more accessible than ever, I know that at least as far back as the fifties children read and reenacted simplified and euphemized versions of William Clark’s and Meriwether Lewis’s life stories, including the latter’s mysterious death. We responded to the heroic encounters with grizzly bears and Native Americans (far less hospitable in our minds than in fact) and pretended to be intrepid adventurers in our nearby woods and streams. The dramatic expertise, bravery and old-fashioned grit of the expedition members held us in thrall, so we didn’t lend much of our attention to the cultural diversity (with the exception of the courageous “Indian maiden” Sacagawea) and amazements of collaboration that made the trip possible. Reading Frank Bergan’s Penguin Edition of The Journals of Lewis and Clark late last year (and this time not skipping the botanical descriptions, peace negotiations and lists of supplies, costs, distances, any more than I’d gloss over the catalogues in The Iliad), I found myself deeply engaged and moved by the story of one man I had hardly noticed in the text when I read a library copy over half a century ago. 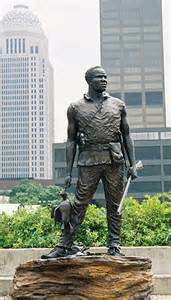 William Clark’s slave and companion was named simply “York,” and now his part in the great narrative, and beyond the knowable story, haunts me.